Ostectomy; osteotomy; periapical surgery; endodontic surgery; prognosis. 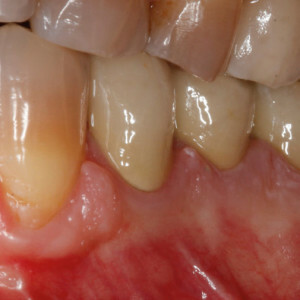 The aim of this investigation was to review the surgical factors related to ostectomy in periapical surgery and their relationship to prognosis. 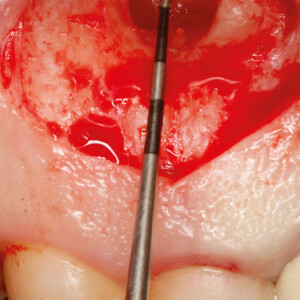 An update was made of different techniques to achieve adequate access to the periapical lesion. 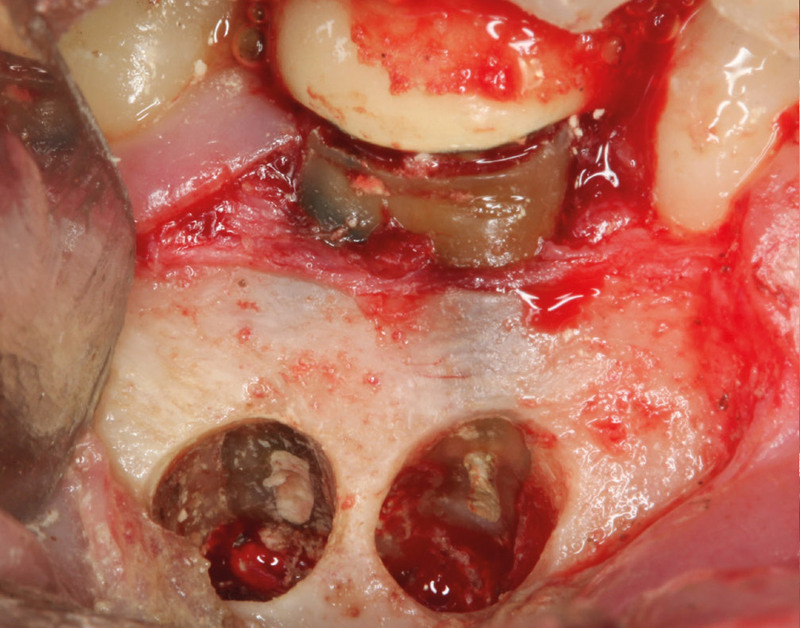 Visual control of the affected roots is important for a successful result in periapical surgery; for this reason, the bone tissue from the vestibular cortical bone must be removed through an ostectomy or osteotomy. The technique used and the amount of bone removed must be analyzed preoperatively, since it will have a direct relationship to the surrounding anatomical structures, the healing time and the need to perform bone regeneration techniques. 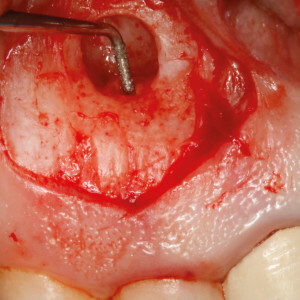 With the use of microsurgical techniques, the size of the ostectomy should not exceed 5 mm in order to reduce the healing time and thus improve the prognosis of periapical surgery. Osteotomy is an alternative technique that allows preservation of the external cortical bone, but has been little studied. 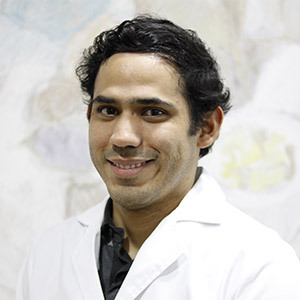 Periapical surgery entails 3 procedures: root end resection, root end cavity preparation and bacteria-tight sealing of the root canal system at the cut root end with a retrograde filling. 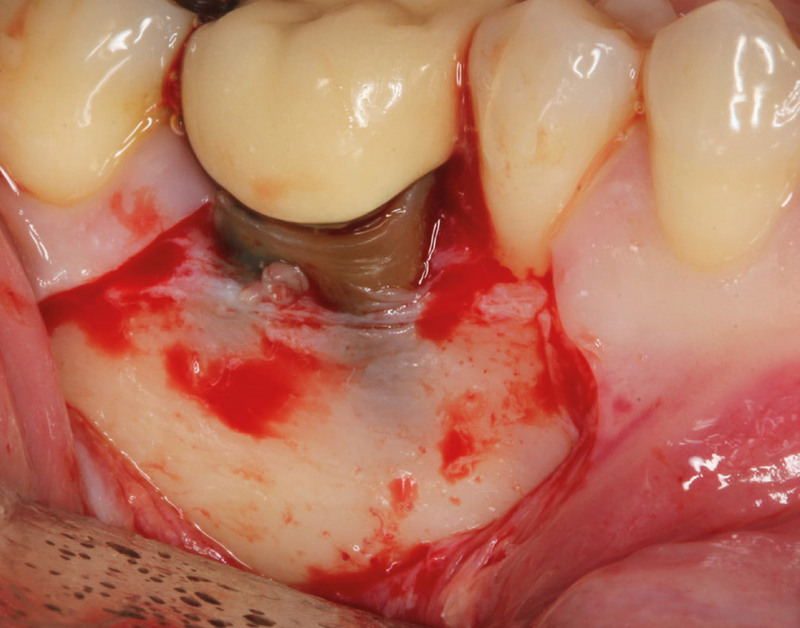 For this, it is necessary to remove the periapical inflammatory pathological tissue to reach the dental apex.1Von Arx T. Apical surgery: a review of current techniques and outcome. → Saudi Dent J. 2011 Jan;23(1):9–15. Many years ago, in 1845, Hullinhen proposed surgical trephination through the soft tissue and bone and into the pulp to alleviate a pathological pulp process.2American Academy of Dental Science; Dexter JE. History of dental and oral science in America. → Philadelphia: SS White; 1876. 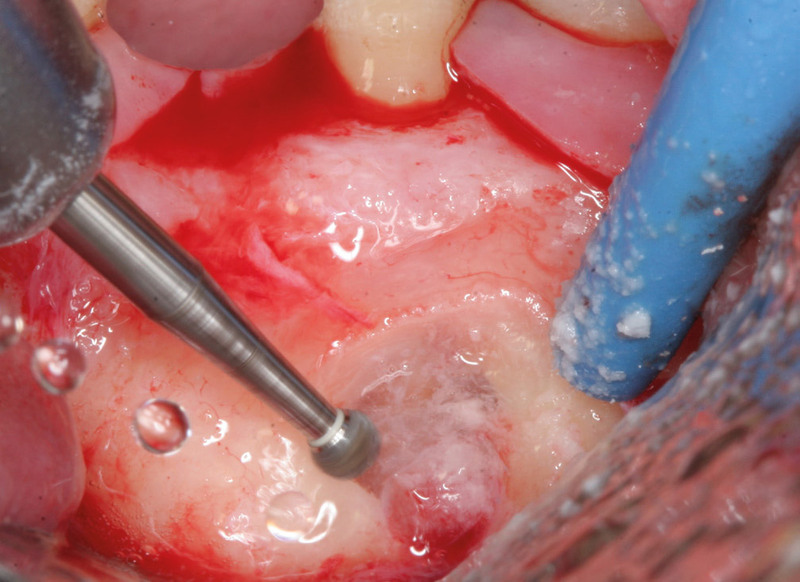 271 p. At present, to access the periapical lesion and obtain visual control of the affected roots, the soft tissue has to be raised and bone tissue from the vestibular cortical bone must be removed through an ostectomy or osteotomy.3Von Arx T, Walker WA. Microsurgical instruments for root-end cavity preparation following apicoectomy: a literature review. → Endod Dent Traumatol. 2000 Apr;16(2):47–62. 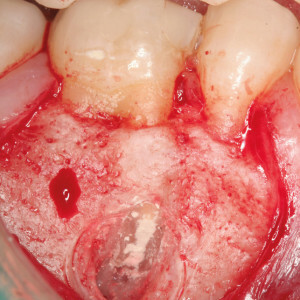 In some cases, the pathological periapical lesion has already perforated the cortical bone, providing direct access to the apex and allowing the removal of the pathological tissue with only a remodeling of the peripheral bone. 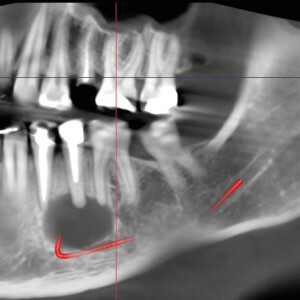 Before surgery, it is important to calculate on a parallel radiograph the length and number of roots, the curvature of these, and the position of the apices and the important anatomical structures, such as the foramen, inferior dental nerve and maxillary sinus.4Syngcuk K, Gabriele Pecora RA. Color atlas of microsurgery in endodontics. Vol. 9. → Philadelphia: WB Saunders; 2001. 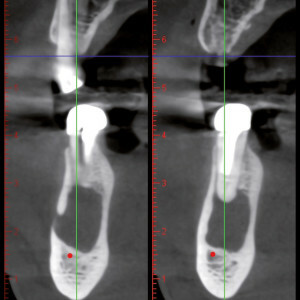 27–28 p. At present, the incorporation of cone beam computed tomography (CBCT) as a complementary radiographic technique has greatly simplified the diagnosis and detection of all these characteristics. Ahn et al. proposed introducing a CAD/CAM-guided surgical template in periapical surgery to minimize the extent of ostectomy for locating the root apex in cases with a thick and intact buccal bone plate and to facilitate surgery on teeth close to problematic anatomical structures.5Ahn SY, Kim NH, Kim S, Karabucak B, Kim E. Computer- aided design/computer-aided manufacturing– guided endodontic surgery: guided osteotomy and apex localization in a mandibular molar with a thick buccal bone plate. → J Endod. 2018 Apr;44(4):665–70. 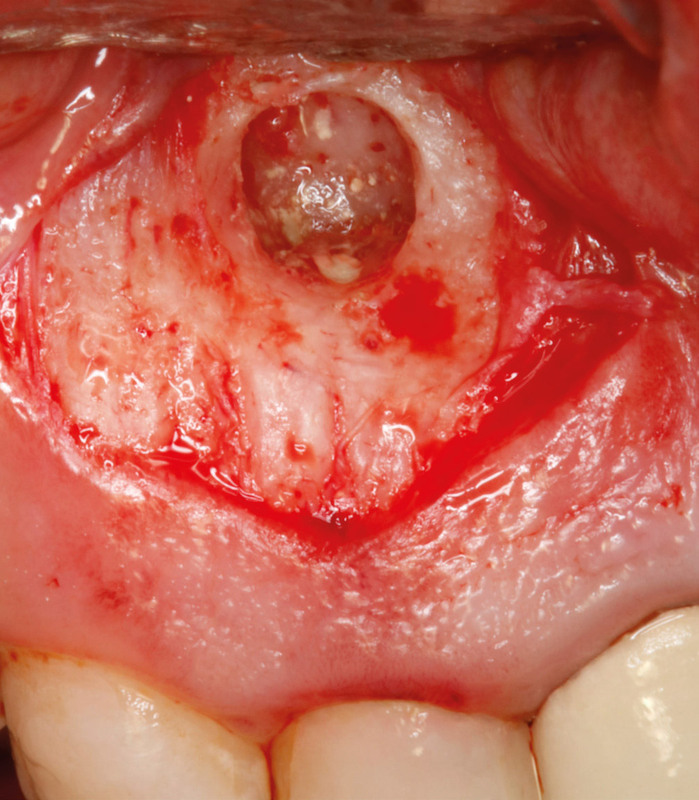 Ostectomy entails the removal of bone tissue from the cortical bone to reach the dental apex. 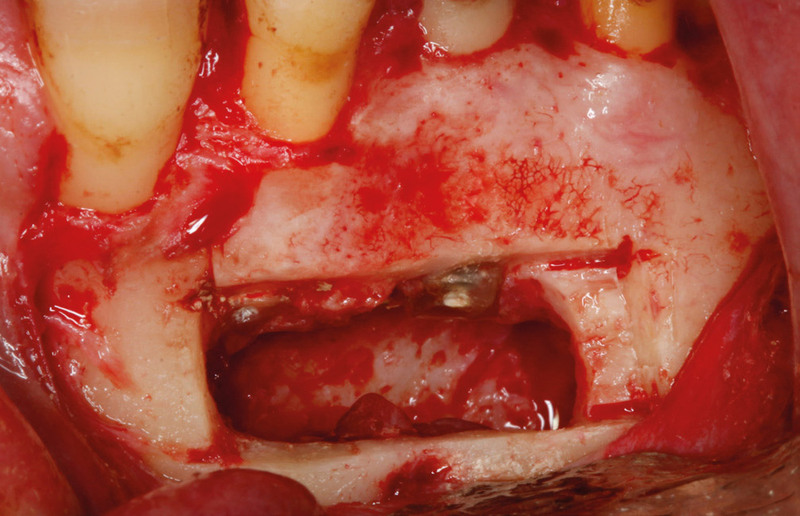 How large an ostectomy should be is predicated on the native size of the lesion, adequate armamentarium access, and proximity to vital structures, such as the mental nerve, mandibular canal and maxillary sinus.6Niemczyk SP. Essentials of endodontic microsurgery. → Dent Clin North Am. 2010 Apr; 54(2):375–99. 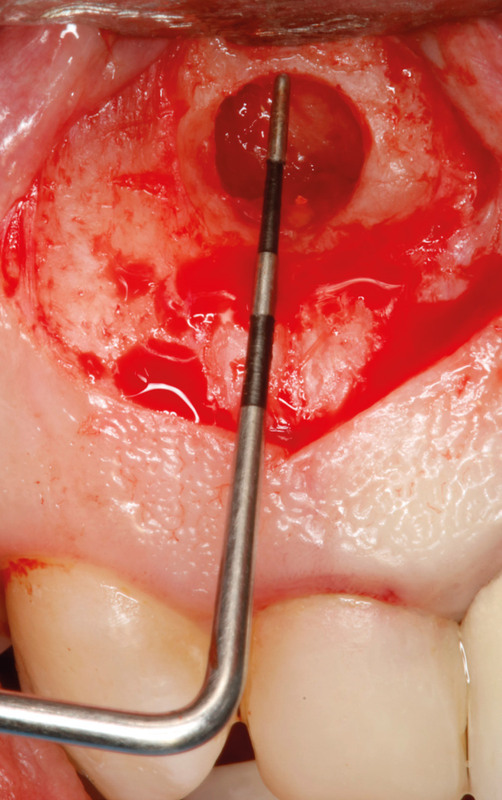 In conclusion, the size of the ostectomy should be as small as possible, but sufficiently large to enable curettage of the entire periapical lesion and access to the instruments needed to perform apical surgery. The ostectomy is done with a round tungsten carbide bur (size 6–10) mounted on a handpiece and abundant irrigation with physiological saline (Fig. 1). Recently, a contra-angle handpiece with a 45° angular head was launched on the market to facilitate injection of only water, not air, to avoid possible emphysema. 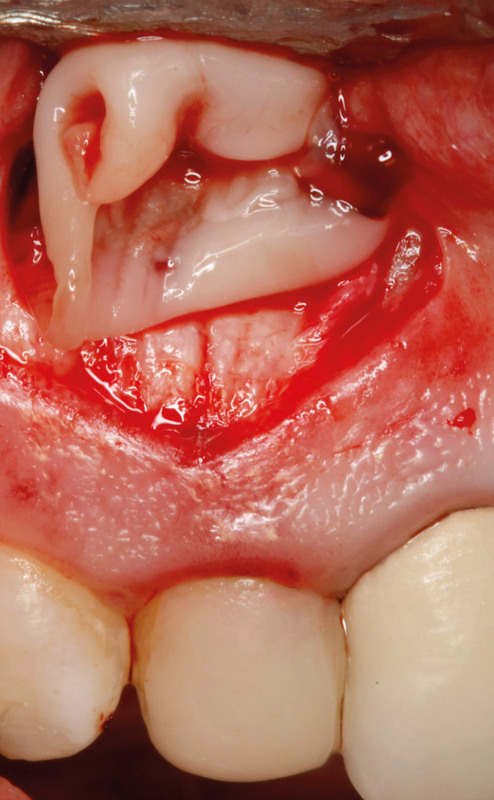 A point between 2 and 4 mm of the apex is selected and a hole is made perpendicular to the longitudinal axis of the tooth until dental tissue is reached. The ostectomy is then continued with small movements of the bur in order to distinguish with touch the difference between bone and root cementum. 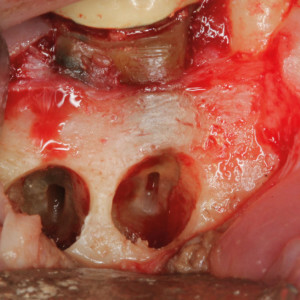 In mandibular molars, the external cortical bone has a higher density and a complicated entry angle, so the ostectomy should be broader to have good access to the roots and be able to identify them clearly, leaving also larger bone defects after periapical surgery, which can be filled with a bone grafting material, optionally combined with the use of membranes. In 1961, Boyne et al. measured labial bone plate destruction after ostectomy and periapical curettage.7Boyne PJ, Lyon HW, Miller CW. The effects of osseous implant materials on regeneration of alveolar cortex. 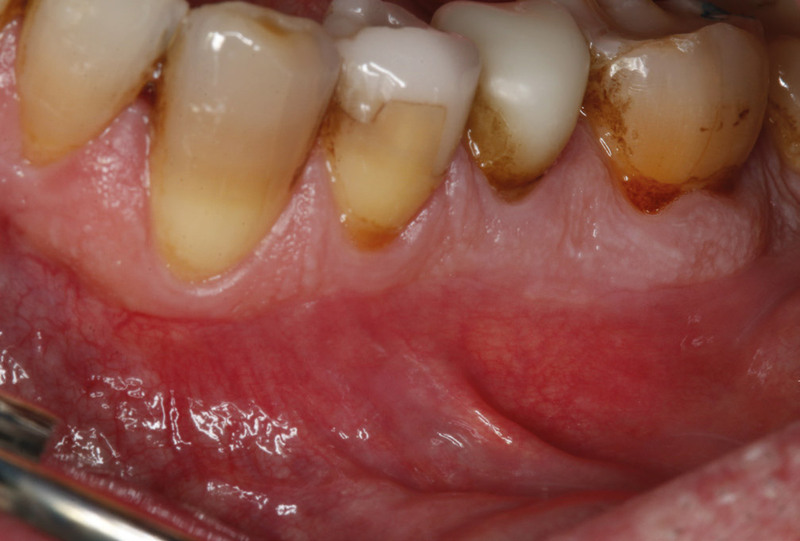 → Oral Surg Oral Med Oral Pathol. 1961 Mar;14(3):369–78. They found that the smaller defects (5–8 mm) exhibited complete bone regeneration, while the 9–12 mm defects showed herniation with fibrous tissue. Ten years later, Hjorting-Hansen and Andreasen made cavities of 5, 6 and 8 mm through buccal and lingual plates or through only the buccal plate of mandibles in 6 adult dogs.8Hjorting-Hansen E, Andreasen JO. 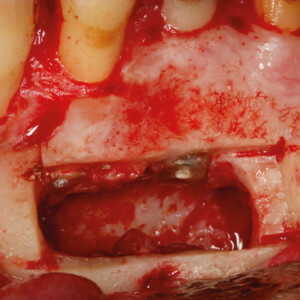 Incomplete bone healing of experimental cavities in dog mandibles. → Br J Oral Surg. 1971 Jul;9(1):33–40. The authors concluded that bone healing was related to the size of the cavity, as well as whether both cortical plates were removed. According to Rubinstein and Kim, there is a direct relationship between wound healing and the size of the ostectomy: a small lesion (0–5 mm) took 6.40 months to heal, a medium lesion (between 6 and 10 mm) 7.25 months and a large lesion (than 10 mm) 11.00 months.9Rubinstein RA, Kim S. Short-term observation of the results of endodontic surgery with the use of a surgical operation microscope and super-EBA as root-end filling material. → J Endod. 1999 Jan;25(1):43–8. 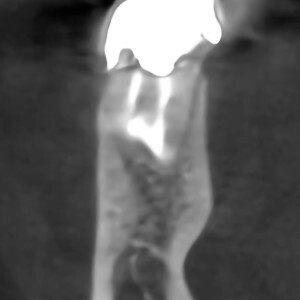 For this reason, in mandibular molars, when the radiographic diagnosis confirms the presence of apical lesions in both roots separated by an intact osseous septum and without inflammatory tissue infiltrate 2 independent ostectomies can be performed to access each root, creating smaller bone defects and decreasing the bone healing time (Fig. 2). 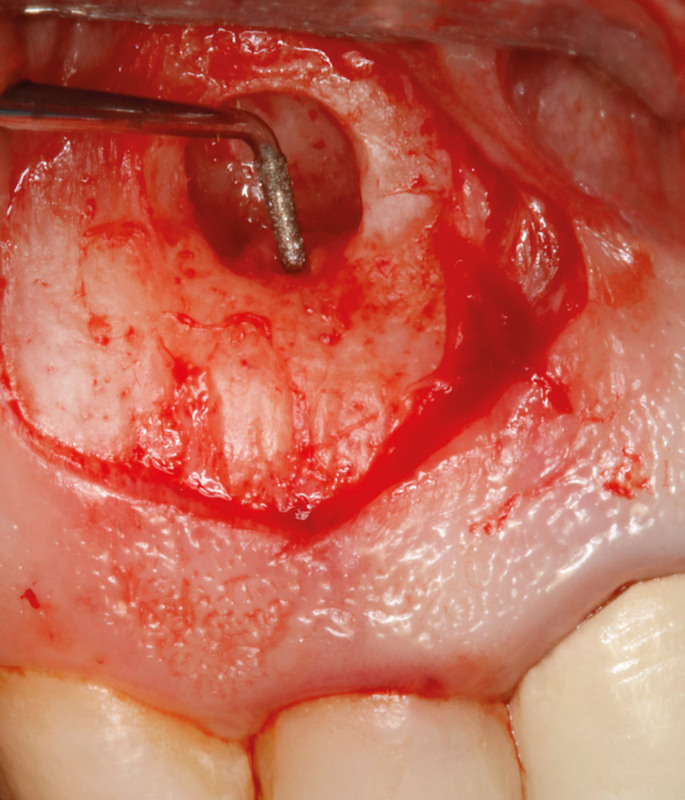 With microsurgical techniques, the size of the ostectomy is significantly smaller than with a conventional osteotomy,10Kim S, Kratchman S. Modern endodontic surgery concepts and practice: a review. → J Endod. 2006 Jul;32(7):601–23.11Chong BS, Rhodes JS. 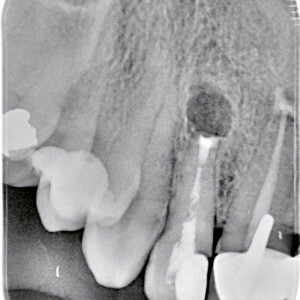 Endodontic surgery. → Br Dent J. 2014 Mar;216(6):281–90. just 4 mm in diameter. This is just larger than an ultrasonic tip of 3 mm in length, yet allows the tip to vibrate freely within the bone cavity (Fig. 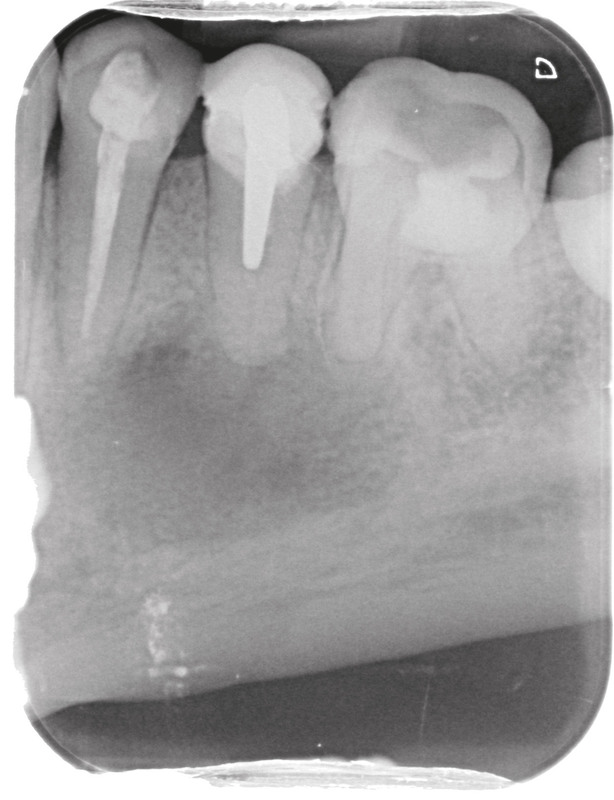 3).12Kim S, Kratchman S. Modern endodontic surgery concepts and practice: a review. → J Endod. 2006 Jul;32(7):601–23. Osteotomy is an alternative surgical technique that allows the preservation of the external cortical bone. Peñarrocha and Sanchis used the so-called window osteotomy, made with hollow cylindrical trephines of different diameters.13Peñarrocha M, Sanchis JD. Técnica de osteotomía “en ventana” en la cirugía periapical de molares. → Arch Odonto Estomatol. 2000 Jan;16(1):221–5. The osteotomy of the cortical bone begins with a trephine of adequate diameter and abundant irrigation with physiological saline, until the cancellous bone is reached, which is perceived as a decrease in resistance during drilling. Once the access window has been created, a small and fine chisel is introduced to lift the bone block. During periapical surgery, the bone lid remains in physiological saline, and it is replaced over the cavity at the end of the surgery (Fig. 4). Currently, the osteotomy can also be performed with piezoelectric instruments. 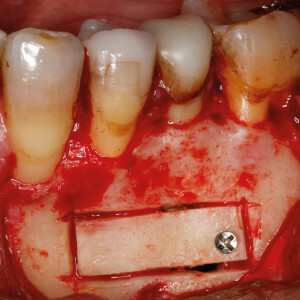 For Abella et al., the advantages of piezoelectric surgery include protection of soft tissue, optimal visualization of the surgical field, decreased blood loss, reduced vibration and noise, increased comfort for the patient, and protection of tooth structures (Fig. 5).14Abella F, De Ribot J, Doria G, Duran Sindreu F, Roig M. Applications of piezoelectric surgery in endodontic surgery: a literature review. → J Endod. 2014 Mar;40(3):325–32. 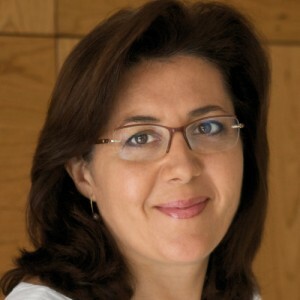 García-Mira et al. showed that there are no statistically significant differences between ostectomy and osteotomy with respect to postoperative pain and prognosis.15García-Mira B, Ortega-Sánchez B, Peñarrocha- Diago M, Peñarrocha Diago M. Ostectomy versus osteotomy with repositioning of the vestibular cortical in periapical surgery of mandibular molars: a preliminary study. → Med Oral Patol Oral Cir Bucal. 2010 Jul 1;15(4):e628–32. Instead, patients in the ostectomy group had increased inflammation. Peñarrocha and Sanchis showed some advantages of the osteotomy window with respect to the ostectomy: (a) simpler and faster in a complicated area such as the posterior mandibular area; and (b) conservation of the patient’s own bone to promote the healing of the lesion.16Peñarrocha M, Sanchis JD. Técnica de osteotomía “en ventana” en la cirugía periapical de molares. → Arch Odonto Estomatol. 2000 Jan;16(1):221–5. The surgical bone defect can be filled with different materials (such as collagen sponge and lyophilized bovine bone) before replacing the bone lid. Osteotomy has been little studied in the literature. 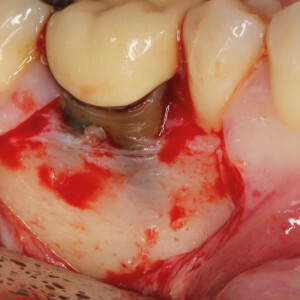 The main complication of this technique, especially if using trephine drills, is the possibility of damaging roots if the position or direction of the cut is inadequate. Ostectomy in periapical surgery is a key step in periapical surgery and necessary to access the apex of a tooth with periapical pathology. Currently, with microsurgical techniques, the size of the ostectomy should not exceed 5 mm if the apical lesion allows it, in order to reduce the healing time. Osteotomy is an alternative technique that allows the preservation of the external cortical bone, but has been little studied. Fig. 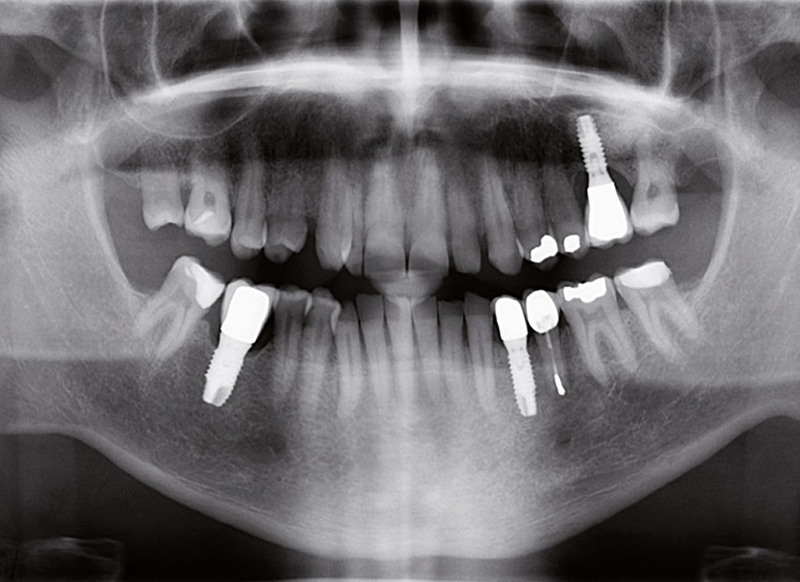 1a – Panoramic image of patient referred for dental implant assessment. 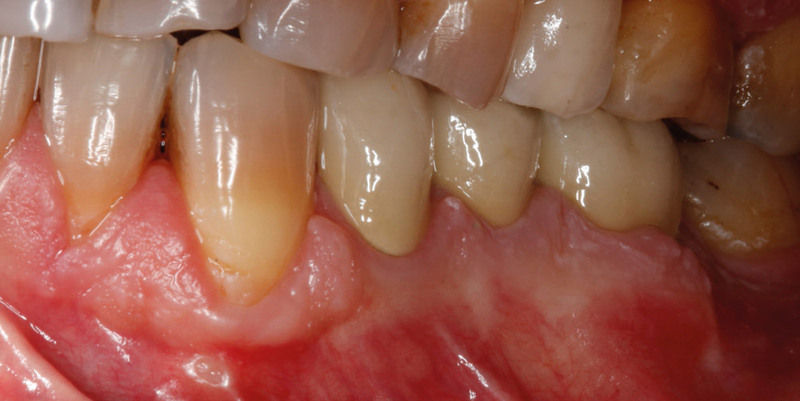 An apical lesion affecting a mandibular left premolar was found. Fig. 1b – Intraoperative image after flap elevation. Adequate retraction of flap to avoid damage of the mental nerve is very important. Fig. 1c – Ostectomy is done with a round tungsten carbide bur mounted on a handpiece and abundant irrigation with physiological saline. Fig. 1d – The ostectomy should measure about 4 mm. This diameter allows the free movement of the ultrasonic tips. Fig. 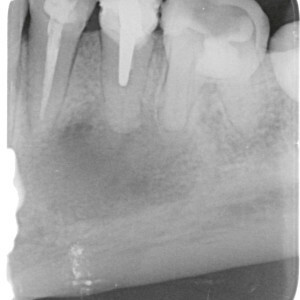 1e – Five-year follow-up panoramic radiograph showing complete healing of bone around the apex. Fig. 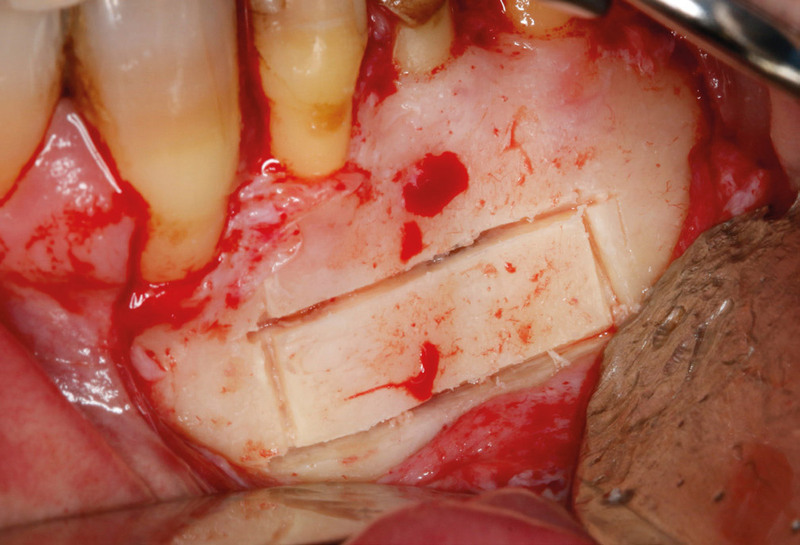 2a – A trapezoidal flap design with a sulcular incision was made to access the mandibular molar with an apical lesion. Fig. 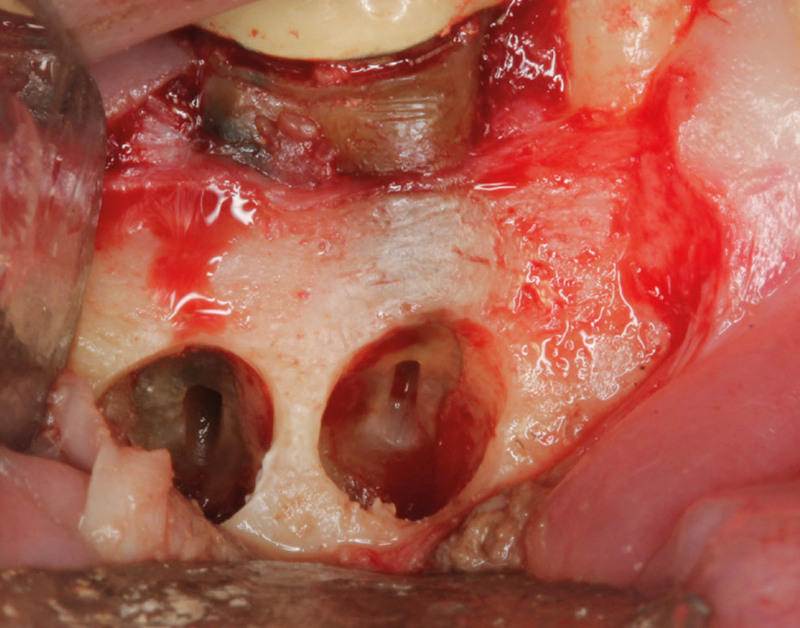 2b – Two independent ostectomies were performed to access the mesial and distal roots, creating a small bone defect. Fig. 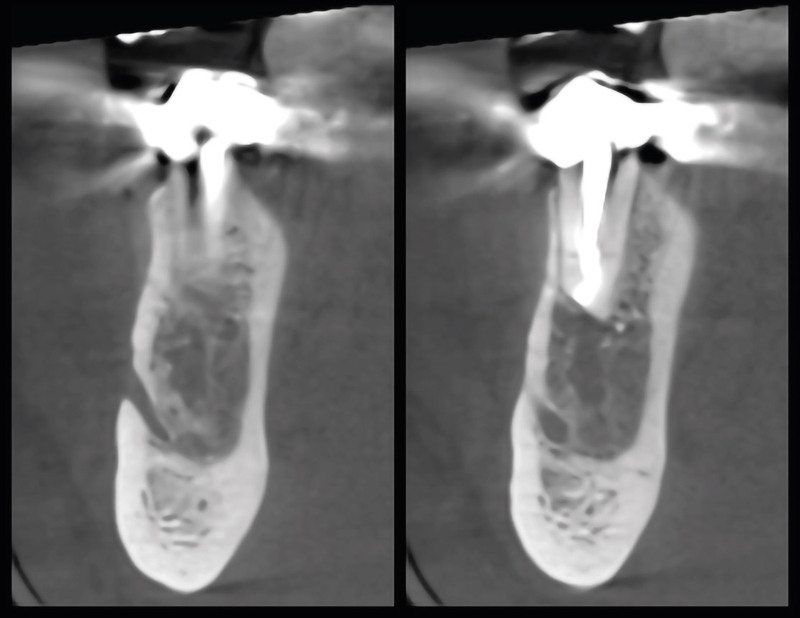 2c – Clinical image of sealing with mineral trioxide aggregate of 2 retrograde cavities. Fig. 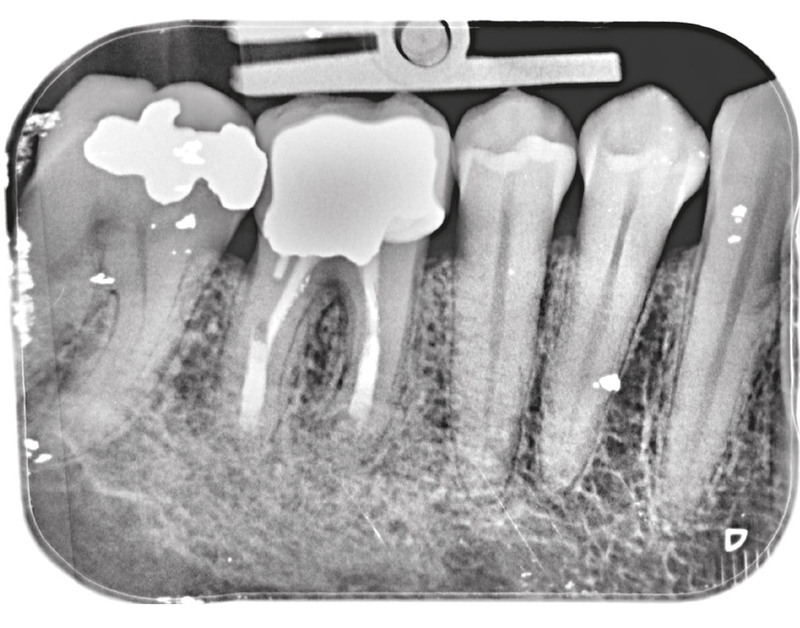 2d – One-year follow-up periapical radiograph showing complete healing. Fig. 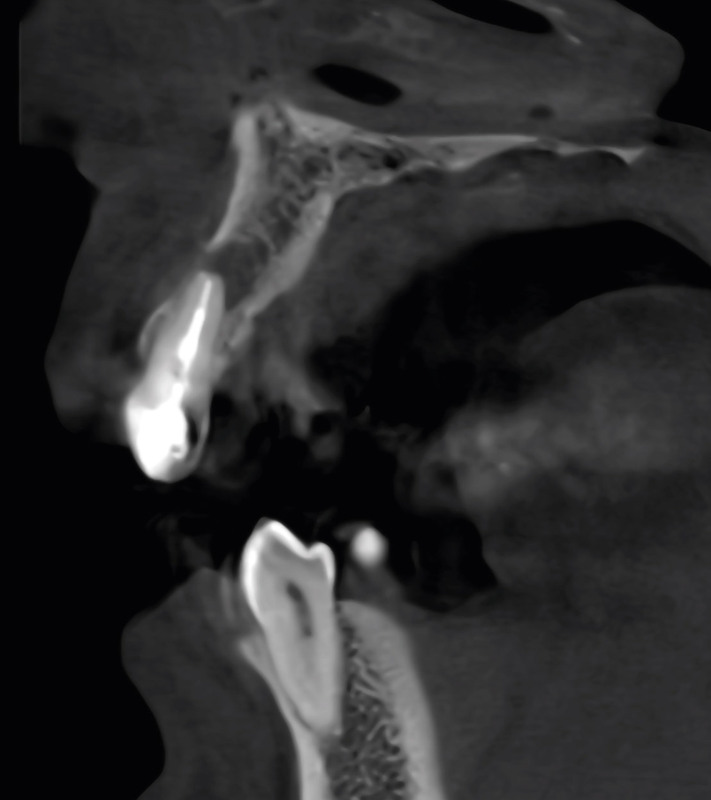 2e – Seal of the retrograde cavity and complete healing of bone can be appreciated in this tomographic view. Fig. 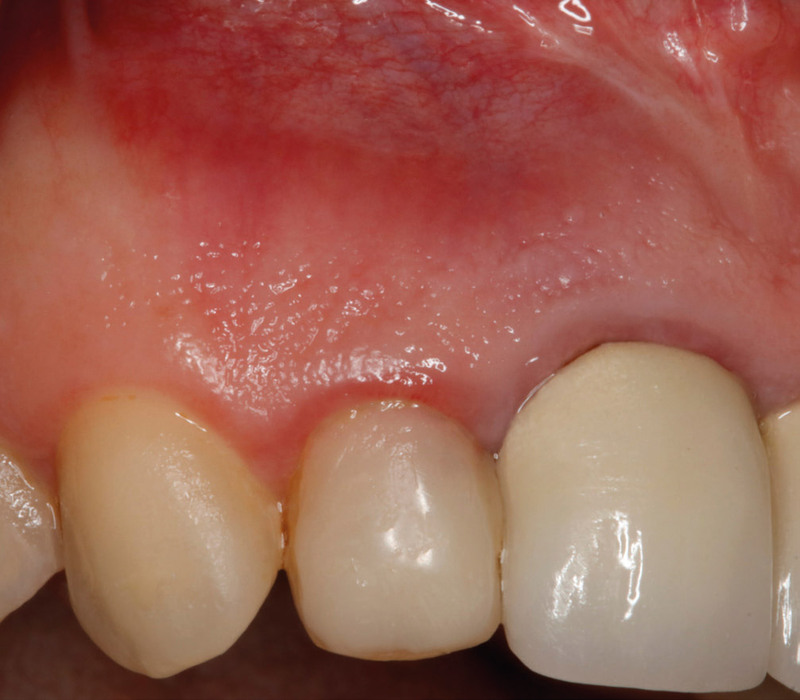 3a – Clinical image of the maxillary right anterior teeth, with healthy soft tissue, in a male patient referred for spontaneous pain in this area. Fig. 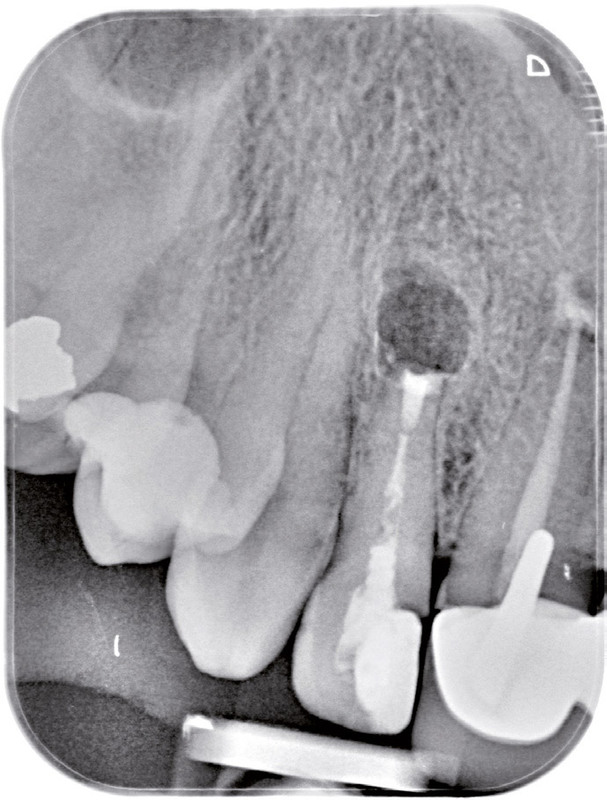 3b – The radiograph showed an apical lesion affecting an endodontically treated lateral incisor. Fig. 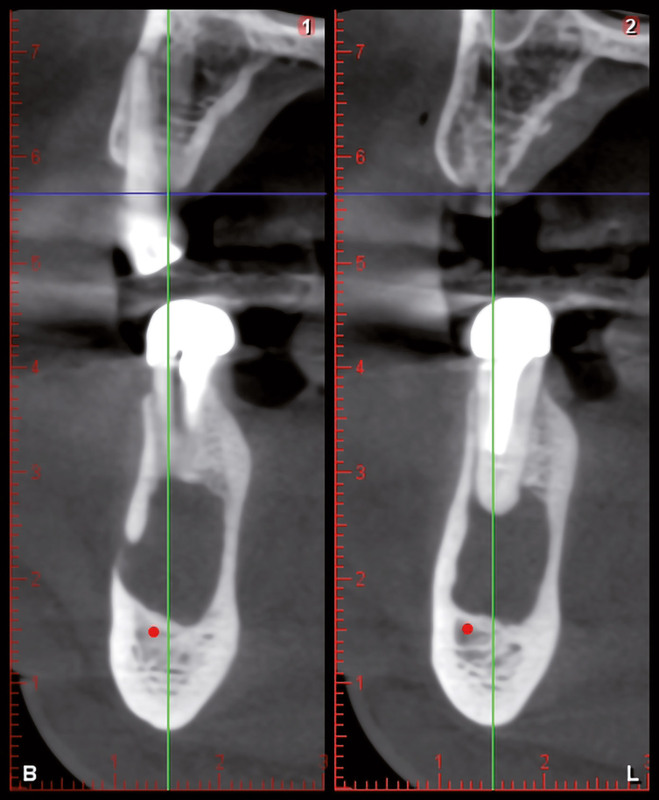 3c – CBCT study clearly showed an apical lesion affecting the cortical bone plate of the lateral incisor. Fig. 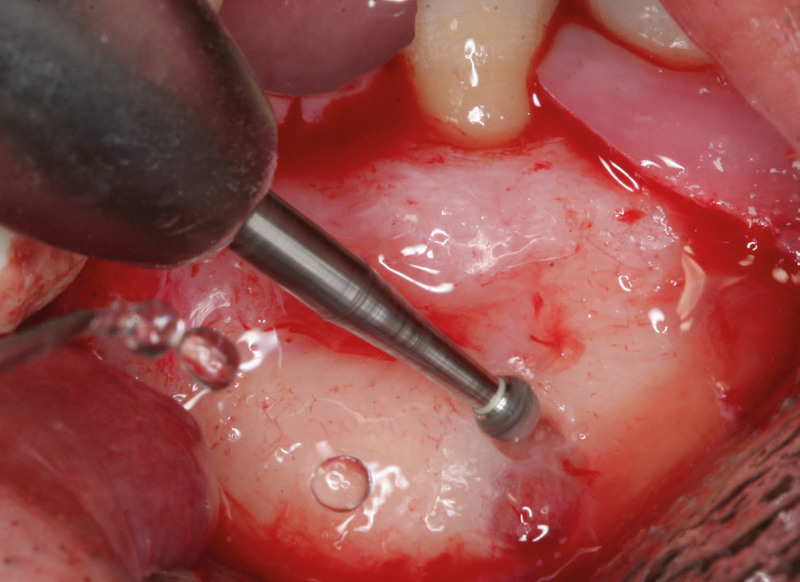 3d – A periodontal probe was used to check the size of the ostectomy. Fig. 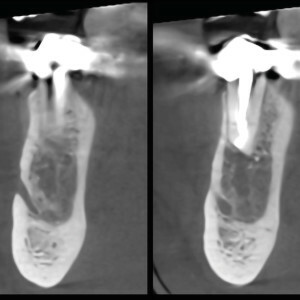 3e – Retrograde cavity preparation using an ultra-sonic tip. Fig. 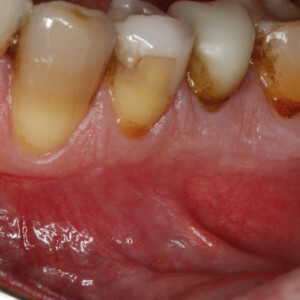 3f – Mineral trioxide aggregate sealing of retrograde cavity. Fig. 3g – A platelet-rich plasma preparation was used to fill the bone defect. Fig. 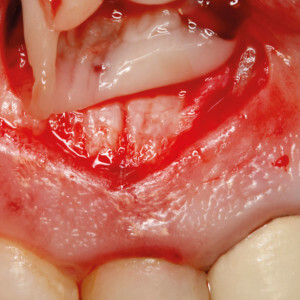 3h – Soft-tissue aspect after suturing. Fig. 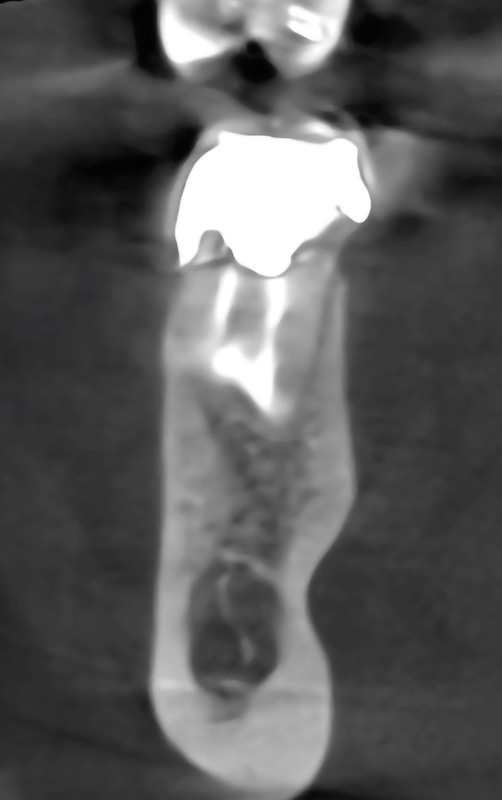 3i – A postoperative radiograph showing the retrograde cavity and mineral trioxide aggregate filling. Fig. 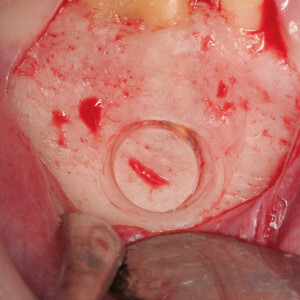 4a – A cylindrical trephine was used to perforate the bone and expose the periapical area. Fig. 4b – Aspect of the root after sealing with mineral trioxide aggregate. Fig. 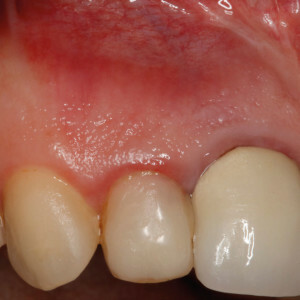 4c – The bone lid was replaced over the cavity at the end of the surgery. Fig. 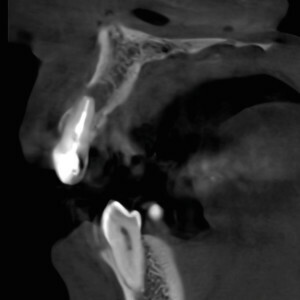 5a – Clinical image of the mandibular area in a male patient with severe pain. Fig. 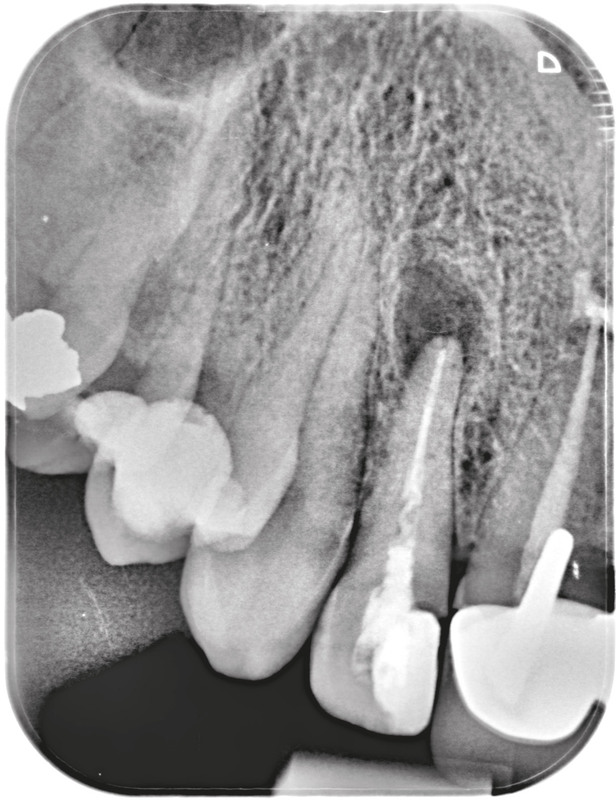 5b – An intraoral radiograph showed a large periapical area associated with the first premolar, which had undergone endodontic treatment, and the second premolar, which had been treated with an intra-radicular post, but had not undergone endodontic treatment. Figs. 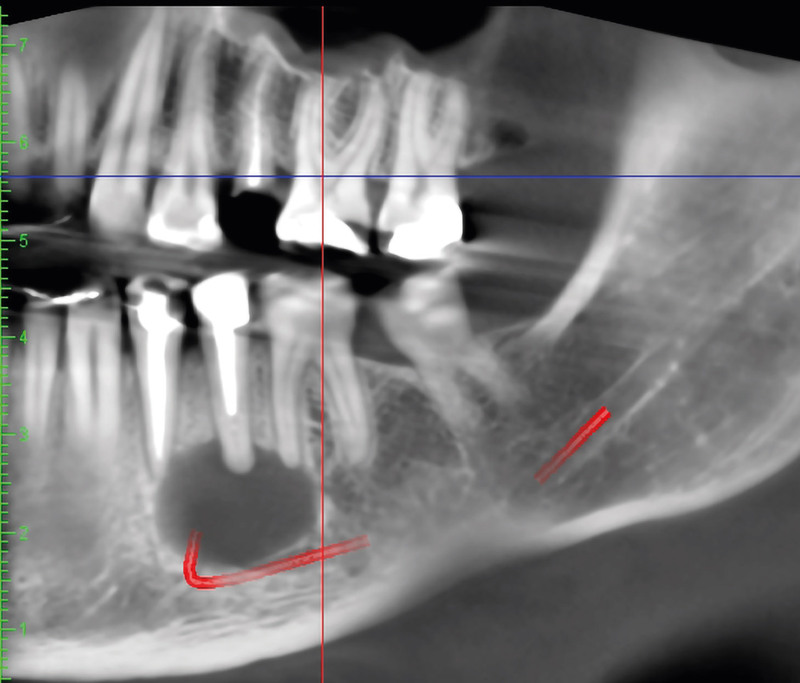 5c & d – CBCT study showed a very close relationship between the apical area, mandibular canal and mental nerve emergence. Fig. 5e – Osteotomy was performed with an ultrasonic device. Fig. 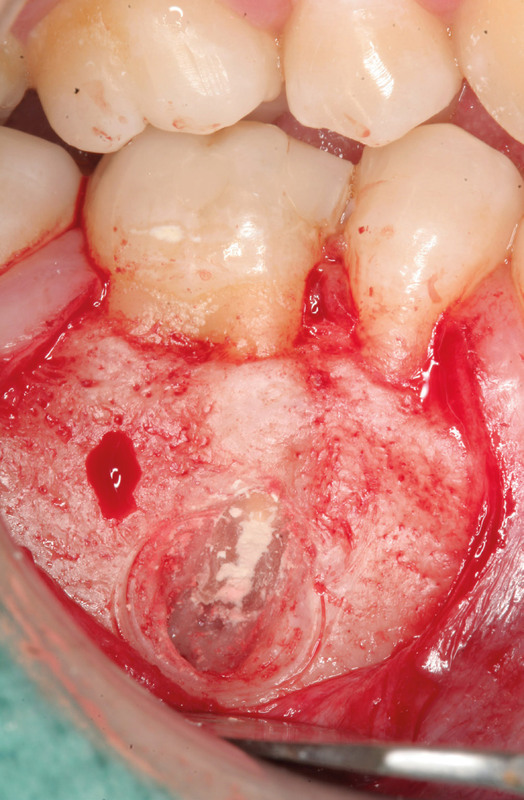 5f – Intraoperative view after lesion removal and retrograde cavity filled with mineral trioxide aggregate. Fig. 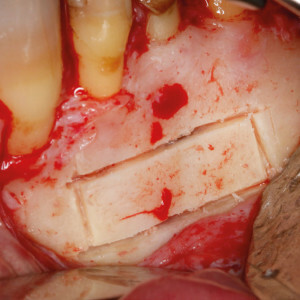 5g – The bone block was fixed with an osteosynthesis screw. Fig. 5h – Clinical view of the soft tissue 1 year after the surgery. Fig. 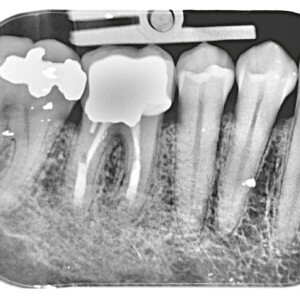 5i – The 1-year follow-up radiograph showed bone regeneration. 1. 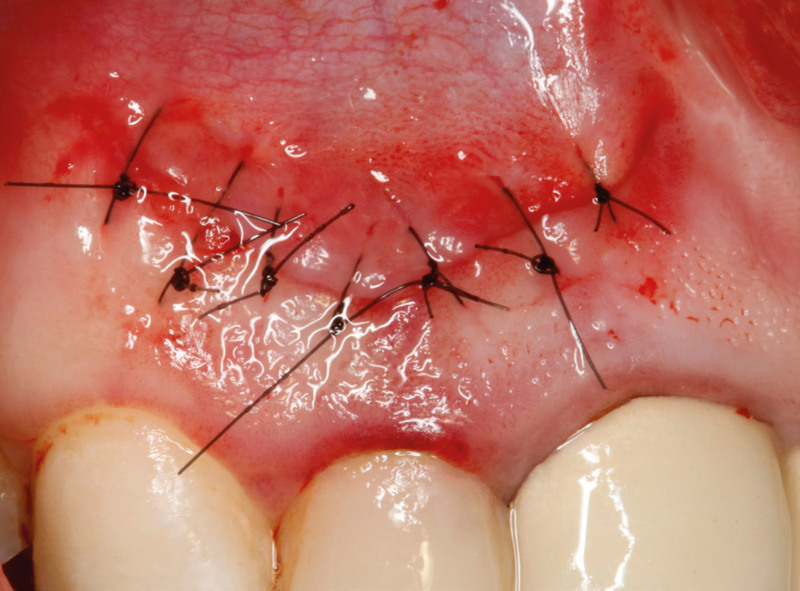 ↑ Von Arx T. Apical surgery: a review of current techniques and outcome. → Saudi Dent J. 2011 Jan;23(1):9–15. 2. 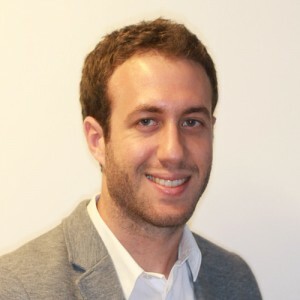 ↑ American Academy of Dental Science; Dexter JE. 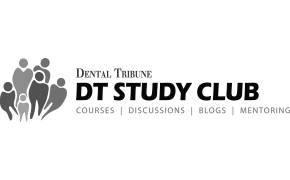 History of dental and oral science in America. → Philadelphia: SS White; 1876. 271 p.
3. ↑ Von Arx T, Walker WA. Microsurgical instruments for root-end cavity preparation following apicoectomy: a literature review. 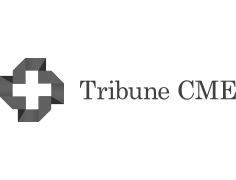 → Endod Dent Traumatol. 2000 Apr;16(2):47–62. 4. ↑ Syngcuk K, Gabriele Pecora RA. Color atlas of microsurgery in endodontics. Vol. 9. → Philadelphia: WB Saunders; 2001. 27–28 p.
5. ↑ Ahn SY, Kim NH, Kim S, Karabucak B, Kim E. Computer- aided design/computer-aided manufacturing– guided endodontic surgery: guided osteotomy and apex localization in a mandibular molar with a thick buccal bone plate. → J Endod. 2018 Apr;44(4):665–70. 6. ↑ Niemczyk SP. Essentials of endodontic microsurgery. → Dent Clin North Am. 2010 Apr; 54(2):375–99. 7. ↑ Boyne PJ, Lyon HW, Miller CW. 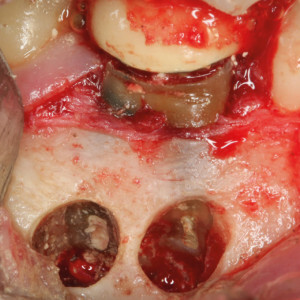 The effects of osseous implant materials on regeneration of alveolar cortex. → Oral Surg Oral Med Oral Pathol. 1961 Mar;14(3):369–78. 8. ↑ Hjorting-Hansen E, Andreasen JO. Incomplete bone healing of experimental cavities in dog mandibles. → Br J Oral Surg. 1971 Jul;9(1):33–40. 9. ↑ Rubinstein RA, Kim S. Short-term observation of the results of endodontic surgery with the use of a surgical operation microscope and super-EBA as root-end filling material. → J Endod. 1999 Jan;25(1):43–8. 10, 12. 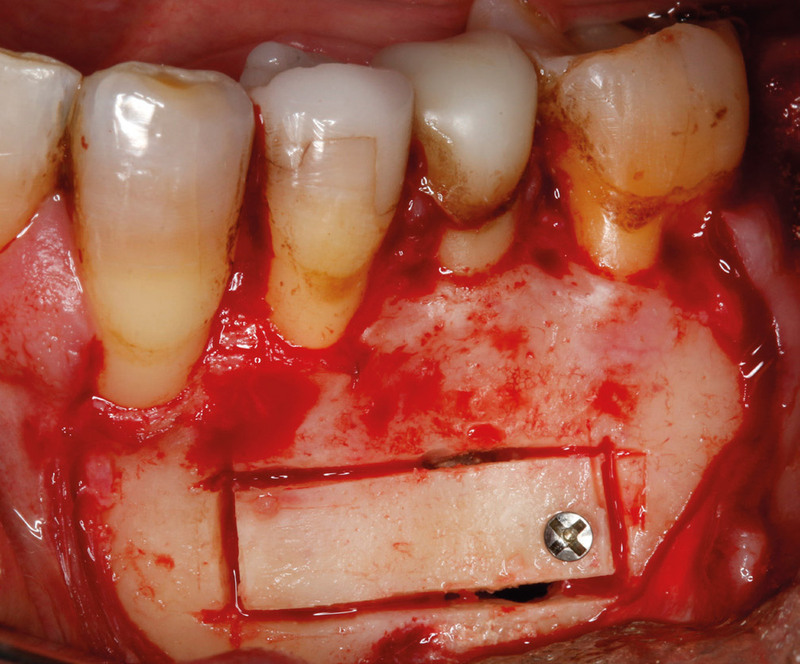 ↑ Kim S, Kratchman S. Modern endodontic surgery concepts and practice: a review. → J Endod. 2006 Jul;32(7):601–23. 11. ↑ Chong BS, Rhodes JS. 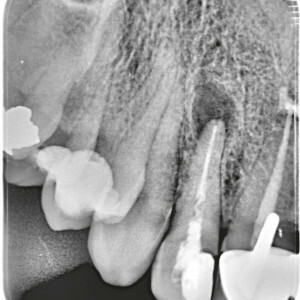 Endodontic surgery. → Br Dent J. 2014 Mar;216(6):281–90. 13, 16. ↑ Peñarrocha M, Sanchis JD. Técnica de osteotomía “en ventana” en la cirugía periapical de molares. → Arch Odonto Estomatol. 2000 Jan;16(1):221–5. 14. 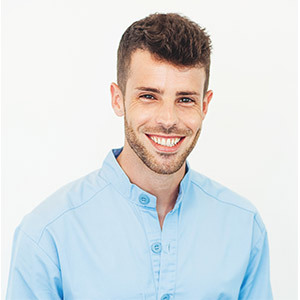 ↑ Abella F, De Ribot J, Doria G, Duran Sindreu F, Roig M. Applications of piezoelectric surgery in endodontic surgery: a literature review. → J Endod. 2014 Mar;40(3):325–32. 15. ↑ García-Mira B, Ortega-Sánchez B, Peñarrocha- Diago M, Peñarrocha Diago M. Ostectomy versus osteotomy with repositioning of the vestibular cortical in periapical surgery of mandibular molars: a preliminary study. → Med Oral Patol Oral Cir Bucal. 2010 Jul 1;15(4):e628–32.